Railpictures.ca - A.W. Mooney Photo: TH&B Rock Trains were fairly common for a short while. This view of the train bound for Port Maitland is from Kinnear Yard in Hamilton; when was the last time it was THIS empty?? Typical dull winter’s day; TH&B 72, 73, 57, 51 and 55 in a scene that has been gone for many years. The TH&B ceased to exist @ 1987. | Railpictures.ca – Canadian Railway Photography – photographie ferroviaire Canadienne. 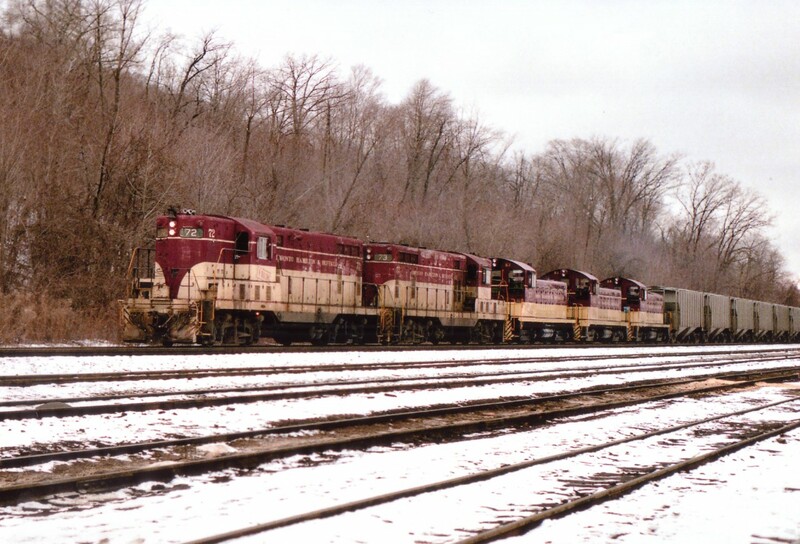 Caption: TH&B Rock Trains were fairly common for a short while. This view of the train bound for Port Maitland is from Kinnear Yard in Hamilton; when was the last time it was THIS empty?? Typical dull winter's day; TH&B 72, 73, 57, 51 and 55 in a scene that has been gone for many years. The TH&B ceased to exist @ 1987. That is a very bleak looking scene Mr. M.
Gotta love the power short TH&B pressing little switchers into road service. Funny Arnold – since the new CP Regime took over the yard is often fairly empty.. believe it or not. Wow – terrific image, Arnold! Thanks for sharing! !